Is Ben Higgins and Lauren Bushnell's wedding really not happening?! Despite Ben deciding to call off their wedding after getting engaged on The Bachelor last season, the couple is still very much together and "very happy." But that doesn't mean we won't see them struggle with their decision to postpone their nuptials on their hit Freeform show, Ben & Lauren: Happily Ever After? "Tonight, in the finale, all of those questions will be answered," Lauren promised E! News' Erin Lim when the couple stopped by to chat about what's next for the couple now that the wedding is on hold. "But right now, we're very happy, we're very much engaged, we've very much enjoying our normal life...we're really taking it day by day, enjoying our time together being engaged." She continued, "In terms of wedding plans and all of that, I think a lot of the same questions you're asking now will be answered tonight." The episode that featured the couple making the decision to postpone their wedding in emotional therapy session shocked fans of the couple, with Ben explaining they felt "an enormous amount of pressure" due to the attention on their relationship. "We're both adjusting to the new normal, which is having our relationship criticized a little bit...and a lot of expectations on us not only as a couple, but on us individually. So I think going into therapy, we both felt an enormous amount of pressure and a little overwhelmed," he explained. "I wasn't surprised there were some really raw emotions that we both needed to communicate. I think one of the healthiest things we did was saying, hey, we're going to have to make a really tough decision by calling off the planning of a wedding right now, and just focusing on us." Of her reaction to Ben's therapy confession, Lauren admitted, "I didn't know that was weighing so heavily on him. That truly was a surprise to me. I obviously know there's a lot of pressure on him and our relationship, but I didn't know it was weighing so heavily on his heart. Obviously, it wasn't necessarily watching it back, but in that moment, what you saw really was news to me in a way." As for their respective family's reaction to their decision to call off the wedding planning, Ben said, "I think most of them knew, or at least they were hopefully in the know enough to not be surprised by that episode. My family loves Lauren, I think her family likes me [Laughs. ], we just spent a week with them, so it would be awkward for us if they didn't. They want us to be happy though. They want our relationship to go well and they want us to have a good foundation." 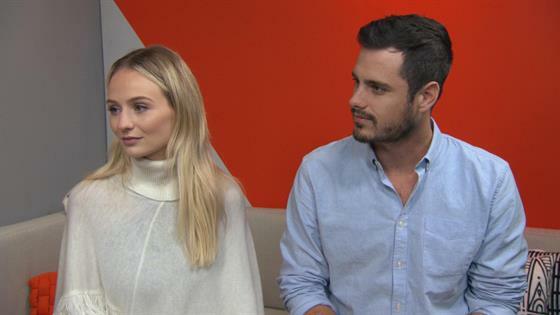 To hear more from Ben and Lauren, watch our interview with them above now. Ben & Lauren: Happily Ever After? 's finale airs tonight at 8 p.m. on Freeform.